A little bit of history was made in the Seanad chamber in Leinster House last Friday. The inaugural meeting of the north south Inter-Parliamentary Association took place. Unionists and nationalists and republicans from all parts of this island rubbed shoulders and participated in the first meeting of a unique and innovative political institution that has its roots in the Good Friday Agreement. Later in October 2006 agreement was reached at St. Andrew’s in Scotland which saw the re-establishment of the Executive and Assembly the following May. And once again it was agreed that a North-South parliamentary forum would be established. George Mitchell memorably told me and Martin McGuinness, after the Good Friday Agreement was achieved and he was going home, ‘that’s the easy bit. Getting it implemented will be the hardest part.’ And he was right. Unionism has sought to minimise and delay the full implementation of the Agreement ever since. There has been considerable progress but frequently the pace of change has been torturously slow and frustrating. And so it was with the north-south Inter-Parliamentary Association. It took 14 years to get to last Friday, but get there we did. So, the Seanad chamber witnessed an equal number of MLAs from the Assembly and members from the Houses of the Oireachtas, under the Joint Chair of the Ceann Chomhairle Sean Barrett TD and the Speaker Willie Hay MLA, taking their seats as part of an arrangement that will see them meet twice a year to discuss issues of interest and concern including the economy, health, environment, energy and social issues. This is a significant political development which should not be underestimated. It reflects the increasing acknowledgement that Ireland is too small for our people to live in isolation from each other and that working together is better for everyone. And in that context and remembering the three days of negotiations at St. Andrew’s six years ago this month, did you notice that the meeting between the British Prime Minister David Cameron and the Scottish First Minister Alex Salmond was held in St. Andrews House in Edinburgh? They sensibly decided to call their agreement after the city and not the place! That historic meeting saw agreement on the right of the people of Scotland to vote in a referendum on the issue of independence in 2014. The future of the Union is now a live debating issue and firmly on the political agenda. 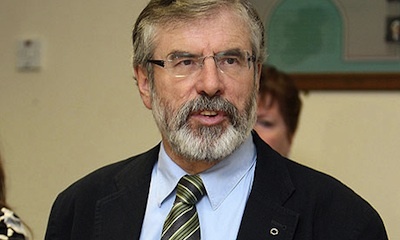 In the Good Friday negotiations Sinn Fein secured the removal of the Government of Ireland Act under which the British government claimed sovereignty over the north of Ireland. There is now only a qualified, conditional claim that will change when a majority of citizens in the north vote for an end to the union. Sections (i) and (ii) referred to are the requirement for the consent of a majority within the North and the provision for concurrent referenda North and South. Predictably, Gregory Campbell rushed to condemn Kenny. But his position was not shared by an online poll in the Belfast Telegraph which produced 46% supporting the Taoiseach’s view that a united Ireland will happen. However, I put it to the Taoiseach that there is a need to go beyond the rhetoric. Uniting Ireland is one of the great historic challenges facing the Irish people at the start of the 21st century. The people of this island have the right to independence and self-determination. Partition is unjust, uneconomic and inefficient. But a united Ireland will only happen when those of those who want it persuade those who don’t that it will be better for them and for their children. It needs a plan, a strategy. We have to demonstrate in practical ways why working as partners and living together as equals on this island is better. So I called on the Taoiseach to come back to the Dail in the next short while with an outline of how he envisages securing the full implementation of the Good Friday Agreement and a border poll. Not surprisingly the Fine Gael leader looked for excuses to do nothing at this time. He argued that it isn’t the right time for this debate and that the Irish government has to sort out the economy first. This is entirely the wrong approach. Now is exactly the right time for a debate on this issue in the context of rebuilding the economies on this island and beginning a process of dialogue and reconciliation around Irish unity. The Good Friday Agreement allows for a border poll. It must be the next step.